I’ll always associate Empress with a certain colleague of mine as she is absolutely in love with it – in the most adorable, ABC (which she is) way. And if you think about it from her perspective, it’s practically perfect – decent Chinese food, beautiful setting and bar, snazzy location at the Asian Civilisations Museum by the Singapore river. In fact, when we had this meal there was an ongoing dragon boat competition which had its starting point at UOB Plaza, right across from Empress, so there was a buzzy atmosphere of excitement. A lot of thought has been put into the interior design of Empress, part of the Prive Group, along the theme of Modern Concubine’s Lair (my description entirely, and I mean this in the best way possible). A hip hideaway yet undoubtedly grand, and I enjoyed sitting next to a massive explosion of scarlet caladenia orchids. Food-wise, we opted for the Sunday dim sum brunch menu. I liked the mango prawn vermicelli fritters and vegetable and mushroom dumplings, both pleasing combinations. Dad was quite happy with the stir-fried beef cubes, though we all agreed that there was too much pastry in the spring rolls – cleverly shaped like a Chinese empress’ long and curly pinky claw/nail (see here) – which also did not have the oil drained off well enough. Desserts however are the stars of Empress’ menu. With four diners, we could have each of the individually-plated desserts available on the brunch menu: jasmine tea poached pear, peanut and black sesame mochi balls, sticky date and longan pudding and a modern burbur chacha. I had the pear, which light and delicate and fruity and a great way to end of an otherwise heavy meal (I always stuff myself at brunches). The other three were classics, well-executed and well-portioned, so you didn’t leave with a food coma. Well…not immediately, at least. This one’s for the memories – may I present to you the sinful, creamy, crispy, crunchy, vibrant, intense, layered contents of Bánh Mì Huỳnh Hoa’s amazing, delectable banh mi. By far the king of Ho Chi Minh’s many banh mi shops, we went back for seconds in the 2.5 days we were in HCMC because it was just. that. good. Generous slabs of pate, three types of processed meat (ok, ham and some broiled pork), melted cheese, and a vibrant mish-mash of vegetables barely held together by two halves of a perfectly toasted bread. The only terribly deceitful thing are those sliced chilis which you can barely pick out at first sight. These chilis are pale green in colour (almost like unripe tomatoes), and are unbelievably spicy. I had the great fortune of biting right into one, and made the mistake of drinking water in a futile attempt to calm my burning palate, and for a good ten minutes sat on my bed and cried the pain off. Yes, we had to get these to go and do the dirty business in the hotel room because there isn’t any seating or standing room (not even on the sidewalk because obviously scooters come first). Thank you housekeeping. Is this the stuff dreams are made of? Apparently so – judging from the comments I received on Instagram after this was posted. When I thought about ordering it, it all seemed too much of an overkill…yet being at the heart of the Shakotan Peninsula a.k.a “Where The Best Uni in Japan is Produced” and “Shakotan Uni Sets Prices for Uni Sold in Tsukiji” really meant there was no decision to make at all. And if it all got too much, I could simply abstain from uni thereafter. The hardest part would be if I couldn’t. Osyokujidokoro Misaki is an uni specialist open only during the uni season, i.e. April to September each year. If you want to eat live uni or murasaki uni, only 15 teishoku of each are available every day so it’s best to be first in the queue. We were quite happy with just having mountains of bafun uni for very, very good value – the uni don above was priced at Y2400. And the uni, ikura and kani don below was priced at Y2300. My sister ordered a very interesting uni toji teishoku – uni, egg, onions and dashi simmered in a little hotplate not unlike hotplate tofu. It was delicious, and I think she made a great choice and really enjoyed her food given that she’s not one for a copious amount of raw seafood. Likewise with dad, who was very satisfied with his grilled fish teishoku (I think it was saba for the day). There was quite the queue when we arrived, despite it being 2pm, and yet we were the only foreigners hanging around. Seems like people are really free on weekday afternoons to drive around for uni! Of course I shouldn’t shortchange the breathtaking coastal drive that leads to Misaki – with bright blue skies, cascading green cliffs and the endless horizon it was really quite perfect. One thing to note is that the sweetness and brininess of the uni, depending on the day’s catch, can be very mild (at that price, it’s certainly not top tier). The rice used is also plain, and not at all seasoned, in order not to overwhelm the seafood. So it would be advisable not to eat too much of those utterly addictive, road-trip friendly konbini snacks…and to thereafter walk off your blissful, uni and carbohydrate-induced coma at Cape Kamui down the road. Planning for the upcoming trip to Japan has got me reminiscing about (and salivating over) this truly unforgettable meal at Tenzushi Kyomachi in Kitakyushu, Fukuoka. As I dissect the experience through my memories, it’s really so much more than the food and hospitality (both of which are AAA++++++) – stringing everything together is my love for Fukuoka and the island of Kyushu. A little wild yet altogether familiar and comforting. As soon as the plane arrived it felt like I was home. And this meal, I think, really pulled me back to the time where I lived here – having first heard about Tenzushi through a friend who was given a treat there by the university professors #perksofbeingaPh.D.student. Not having the guts to splash that much on a single meal and without eating companions – student life – I gave it a miss and convinced myself how much more I’d appreciate it when I came back with the right company and better educated about Japanese fine-dining. So this January it was such a privilege to finally make this meal a reality. I daresay patience made me savour each piece all the more; akazu shari: warm, pillowy and held together just-so, yet collapsing gently on the tongue like a lovely maiden lying down for a rest, and thoughtfully paired with various neta and assorted toppings. The highlights for me were the fugu shirako (blowfish’s milt; first grilled and exploding into a parade of temperatures and textures), kohada (gizzard shad; perfectly cured and balanced, also, I love hikarimono), kuruma ebi (a Kyushu specialty) and anago (the dream! divided into two pieces, one salted and the other generously doused with tare). Actually, the shortlist may well be an excuse not to write so much. I really couldn’t find fault with any piece – even the whelk topped with okra, and that’s something because 1) I don’t particularly fancy sinuous shellfish and 2) I never, ever eat okra. A was quite surprised when I popped the whole piece into my mouth. But at that time I had such complete faith in itamae Isao Amano that it was just instinct. Best of all – Amano-san and his assistant daughter were so incredibly kind. We were fortunate enough to be seated front and centre, sandwiched between a Japanese couple and a Japanese businessman who had flown in from Tokyo just to have this meal and had to catch a shinkansen back right after. I suppose the Japanese were regulars because they had the kohada and uni pieces weaved seamlessly into their omakase – and when he caught me eyeing these asked if I wanted any other pieces. There’s only one answer to that. As a parting gift Amano-san gave us an autographed book of his sushi, and asked if we would be coming again…of course, there’s also only one answer to that. Having Italian cuisine (or any European cuisine for that matter) in Japan is always an experience that requires an open mind. As much as Japanese have great admiration for western cooking techniques and flavours, they also have an incredibly deep respect for local produce – which brings about a delightful combination of tastes and textures, as long as you don’t go in looking for something too traditional. We experienced this at Moliere in Sapporo, and equally so at Otaru Dining No Name, a hidden gem of a restaurant that’s just recently opened in Otaru. 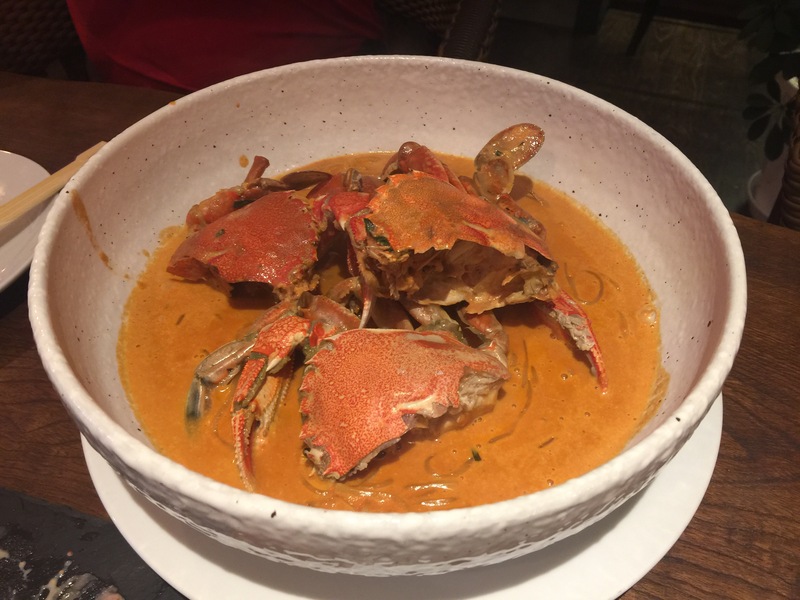 This ヘラカニスパゲティー crab spaghetti in a tomato cream sauce is a case in point. A massive umami bomb in that sauce which quite certainly had crab roe mixed in to create layers of incredible flavour oscillating between the underlying sweetness of tomato and the distinct hit of crustacean brininess. The spaghetti, meanwhile, was dense and chewy – almost ramen like – but absorbing well the flavours of the sauce. So good. We also had antipasti, which interestingly included an eggplant parmagiano, only made with a dashi/soy base instead of tomato sauce, a soft cheese (camembert would be my guess), herb sausages, ham, pickled asparagus, smoked salmon and mentaiko on croquettes. Delicious, and very value for money at the ¥1500 it was priced. This was followed by salmon and kinoko cream pasta, an elegant take on the otherwise classic combination most often found in Japanese supermarket sauce packets. Also, a seafood aglio olio with a massive langoustine bloated with roe, another whole crab, calamari, sea urchin and grilled prawns. Sea salt was used generously, as were herbs grown in the restaurant’s quaint front porch garden. Ramen-pasta was the base in both dishes. No complaints. We thoroughly enjoyed our dinner here, in a quaint, beautifully appointed space with a most hospitable chef-owner quite enamoured with Europe. A small but well-rounded menu – I would love to see how it progresses the next time I stop in Otaru. Food is so much a part of any adventure. And it isn’t difficult to make that a good part, memorable for all the right reasons, like dropping an email to secure two counter seats at the buzzing Chinatown/Soho outpost that is The Palomar. Even better when doing so gets you plonked right in front of the captain – “CHEF” Tomer Amedi – who was an excellent host and all-round incredible multitasker. Amedi manages to refine and intensify already addictive Israeli / middle eastern flavours, while delivering generous portions. We curated our menu for the evening based on a mix of recommendations and tastebud inclinations. And I must say that the latter proved the most reliable, after all. Highlights include the Beets-Go-Prawns, smoky beets propping up Josper-grilled prawns with just a hint of sumac and char. The hand-chopped chicken liver pate was chunky without being grainy, and well-balanced by the crisp, almost biscotti-like toast squares that accompanied. Truffle lovers would also go wild at the silky polenta topped with bright asparagus, mushrooms, parmesan and truffle oil – classic combinations that never fail to delight. But the real star was, without a doubt, Octo-Hummus – a wild party of the earth and sea with octopus grilled to the point where a delightfully crispy exterior has formed, while leaving the interior unctuously velvety. Accompanying hummus was the perfect foil for the oily octopus, and the basil cream dressing lifted the entire dish by leaving a lovely clean aftertaste on my palate. So divine, we had seconds. It’s near impossible to end a meal here without a huge smile on your face. The Palomar team have such a love for the food they cook, which is quite palpable in each dish. And that really makes all the difference.